New players' first deposit only with code ONE. Offer available until further notice. Max 100% bonus up to £50 + 25 free spins per first £10 min deposit. Wins capped at £2.50 & paid out in bonus that must be wagered 50x before cashed out with its respective winnings. Withdrawal restrictions & full T&Cs apply. Fruity Vegas Casino will then reward you with a bonus (Welcome Bonus is for new players only). The terms and conditions of the bonuses vary between different casinos and might also change over time and between different countries, so it is important to compare the different offers and read the T&C for Fruity Vegas Casino before signing up. So much more than your ordinary online casino, Fruity Vegas is all about excitement, surprise and retro style class glamour. Exuding swing and sophistication, nostalgia and optimism, Fruity Vegas Casino offers players a unique atmosphere and vibe designed to delight and surprise you. Step inside this virtual casino and book your spot at one of their exciting roulette and blackjack tables. Try your hand at live casino, classic card games and enjoy the excitement of video slots. Whatever your style of play is, we are sure you’ll find it at Fruity Vegas Online Casino. 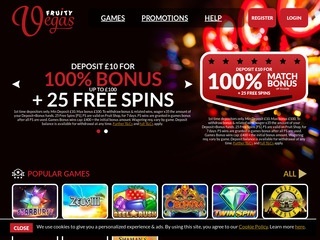 Fruity Vegas Casino is part of 888 Holdings PLC group, a renowned leader in the online casino industry and one of the largest companies in the world. The company is enlisted on the LSE since September 2005 and is licensed by the Government of Gibraltar under License Number 022 to offer European and UK bettors legal and regulated services. The games offered at Fruity Vegas Casino bring you unmatched excitement and thrills, surprises and plenty of winning opportunities with every roll of the dice, spin of the reels and deal of cards. By choosing to sign up at the casino, you’ll be choosing to experience the fabulous iconic glitz, glam and style of Vegas straight to your mobile or PC. Don’t get us wrong and probably think we are out to promote the site. As much as we’d like to, it’s all about writing a true representation of what they have to offer. A quick tour of the casino will reveal that they present an unlimited selection of video slot games. The portfolio includes in-house games such as The Rise of Pharaohs, The Big Lebowski, Treasure Fair and Jack’s Pot are popular among players. If you are searching for the latest release, there’s plenty to choose from, but we recommend you try the internet’s favourite game Asgardian Stones or Asteroids. There are also branded games such as Motor Head, Planet of the Apes, and Monopoly for you to play. Is live casino gaming your ‘thing’? Are you looking for the real deal? Scroll over to Fruity Vegas’s live casino page and try games such as live blackjack, live baccarat and live roulette. These games let you play, chat and win in real time with mates, and players with similar interests from all over the world. Overall, Fruity Vegas has everything and anything that you’d wish for in a casino in terms of games. 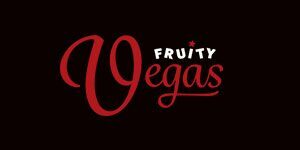 From classic arcade style slots, huge progressive jackpots, and classic card and table games, you’ll find them at Fruity Vegas. All these games have been optimised for play on both mobile and PC platforms. They take very short time to load and when they do they play smoothly without causing your device to lag or freeze. After playing the games at Fruity Vegas and taking a few time to navigate through their pages, we concluded that the casino wants all its members to enjoy the many amazing games regardless of the mobile phone that you are using. This commitment to inclusion means that Android, iOS, Windows, Blackberry and Symbian powered mobile phones can all be used to access the site without any hassle. Speaking from experience, we tried the casino using the iPhone 5S, 6 and 6S before using Samsung, HTC and Sony Android-powered devices to access the site. The games load fast, and the quality of graphics isn’t affected as with most of the other casinos. However, for the best experience, we suggest that you choose the landscape mode, where the game can be played in full-screen mode. Also, players using the iOS platform should consider downloading the Fruity Vegas Casino App from iTunes in order to have access to exclusive promotions. The epitome of casino gaming, Fruity Vegas fuses state of the art sophistication and style with the excitement and surprise of a dedicated website featuring some of the best games online. We’ll commend the choice of colour, which lets you play the games for long without straining the eye. The site is also arranged neatly making it easy for you to find whatever game or promotion that you are looking for. You’ll find it easy choosing your favourite game as they are categorised according to themes (Urban & Living, Action & Sci-Fi, Big Brands, Animals, Adventure & History, Classic & Arcade among others), or you can use the search feature to easily find the game you have in mind. All these apply to both mobile and PC platforms. Fruity Vegas is a secure and safe platform to play the game at. A quick look at the security certification indicated that they use the latest 128-bit SSL encryption technology, which ensures all the sensitive data is transferred securely over the internet. The casino is also a registered member of internationally renowned third-party auditing companies such as eCOGRA, which ensure that the casino upholds high levels of security and integrity. It’s very clear that Fruity Vegas Casino endevours to achieve the highest level of customer satisfaction evident in their delivery of professional and excellent customer support services. Our interactions with the team lead to a conclusion that majority of the agents are experienced and highly trained to handle issues that arise at the casino. The agents work round the clock and can be reached through multiple channels including the live chat, email @ [email protected] or mobile @ 0800 018 3307. At the end of our play at the casino, we easily concluded that Fruity Vegas is out on a mission to offer players a platform that they can trust, one which follows through on what they promise to offer and strictly adheres to the standards and principles of an online casino that players can jump on board with long term. We must commend their exemplary service delivery; very fast, effective and attention is paid to the player where needed, as well as their mobile optimized platform. It makes gaming on the move easy, convenient and fun. What they however need to improve on is the time they take to complete the KYC process. It curtails so much including withdrawing ones winnings in time. If this is a strategy to get players to spend all their money on the platform, then it is definitely working. Otherwise, it’s a site that we highly recommend to any player!